Valerie Long is a Charlottesville attorney at Williams Mullen who has represented a number of local developers and wireless telecommunications companies. As of 2012, she is also the First Vice Chairwoman of the Board and the Chair-Elect of the Charlottesville Regional Chamber of Commerce. ↑ Web. 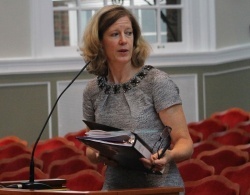 Albemarle Supervisors consider changes to wireless tower policies, Tim Shea, Charlottesville Tomorrow, 8 Sept. 2012, retrieved 10 Sept. 2012. ↑ Web. 2012 Board of Directors, Charlottesville Regional Chamber of Commerce, retrieved 10 Sept. 2012. This page was last edited on 25 July 2017, at 18:51.